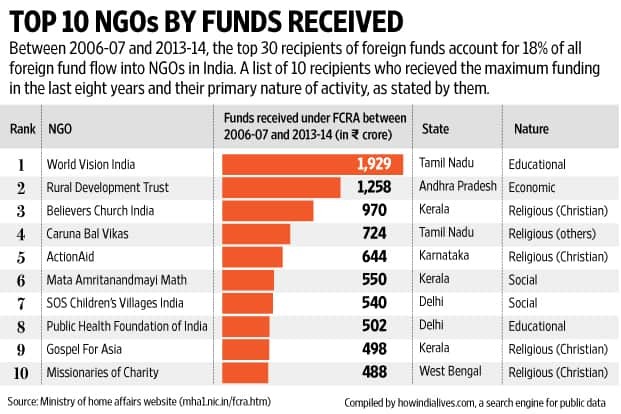 Running for cover: Who needs NGOs? New Delhi: The only two Nobel peace prizes awarded to Indians thus far were given not to politicians, statesmen or religious leaders, but to a woman and man who chose to work with the poorest of the poor as part of the voluntary development or non-profit sector of the country. You may or may not agree with the religious politics of Mother Teresa and her Missionaries of Charity or Kailash Satyarthi and his Bachpan Bachao Andolan’s publicity-driven methods. You could also be among those who believe that such awards are meaningless because the West has a tendency to felicitate those who showcase the worst side of developing countries such as India. Yet, it is hard to deny that Mother Teresa, Satyarthi and their teams, who are part of the Indian civil society organization (CSO) universe, have had a role to play in changing the social fabric of this country. And, their contribution, in no small measure, was made possible by the funding they received from international organizations and donors from time to time. In June 2014, a “leaked" Intelligence Bureau report alleged that some CSOs, funded by international agencies, were hindering India’s economic growth with their anti-national activities. Ever since, the drive to restrict foreign funding to such CSOs—initiated under the United Progressive Alliance-2 government in 2010 with the amendment to Foreign Contribution (Regulation) Act, 2010—has picked up pace under the National Democratic Alliance. In March and April, about 9,000 notices were sent to CSOs for non-compliance. The Ford Foundation, a grants agency working in India since the 1950s, has been put on a prior-permission list, and Greenpeace India’s foreign funds and bank accounts were frozen, yet again. A 2012 Institute of Rural Management, Anand, Think Tank Initiative report titled Voluntary Sector in India: Challenges, Opportunities And Voices From The Field highlighted that the sector is a critical partner of the government and corporate entities when it comes to implementing social welfare schemes and deepening the role of democracy. However, the social sector remains under-recognized, governed by archaic and regressive laws, and is asked, every now and then, to prove its commitment to the country and its people. “CSOs come in all shapes and sizes, some with warts and wrinkles, too, but they have an important role to play in a democracy. The roles are varied: role of a watchdog on human rights violations; champions of specific causes; role of citizen mobilization and organizing and a bridging role between the citizens and government; or as research houses, technical experts, civic innovators. Many a times, CSOs partner with governments to improve systems and at other times at the grassroots with citizens—in a democracy often their role is cross-functional. But if they want to be truly relevant and move the needle, the best way is to be part of the solution and then be part of implementing the solution. We need to move beyond playing ‘think tanks’ and be ‘thinking DO tanks’ says Swati Ramanathan, co-founder, Janaagraha Centre for Citizenship and Democracy, a not-for-profit organization, and chairperson of the Jana Urban Space Foundation, a not-for-profit working on urban planning, Bengaluru. Last month, reacting to the spate of action against CSOs, more than 200 non-profits came together to endorse an open letter to Prime Minister Narendra Modi at Press Club in Delhi, which stressed the importance of CSOs and their “deep concern at how CSOs in general and their support systems, including donors, are being labelled and targeted". Amitabh Behar, executive director, National Foundation of India (NFI), an independent grant-making and fund-raising organization, says: “We welcome surveillance and scrutiny of our actions because we have nothing to hide. However, this inspection cannot be one-sided and cannot start with suspicion. Besides, if the government is pushing the private sector to bring in foreign investment, why is it curbing CSOs from receiving foreign funds?" But not everyone agrees with Behar that investment in the private sector by foreign agencies is the same as that in CSOs. “Let’s consider this: Will the US allow its NGOs (non-governmental organizations) to take money from Russia to oppose its war in Iraq? They will not do that. Will the UK allow Chinese money to come into a non-governmental organization to fight for the UK to remain in the European Union? No, they won’t. So we have to be careful about this and not bash the government every time such an issue arises. As citizens of this country, we should take a call whether we want overseas money to come to India and fund some NGOs and push an agenda that they have," says T.V. Mohandas Pai, chairman of Manipal Global Education and trustee at one of the largest NGOs in the country, the Akshaya Patra Foundation, which provides mid-day meals to government schoolchildren. Besides, as Ramanathan points out, CSOs too must understand that they cannot demand transparency and accountability from the government if their own house is not in order. “Transparency is required in finances, objectives, and impact measurement. Complying with the law of the land is a given." To be run like a business, non-profits need to devote a certain amount of their funding to administrative costs, and often that is frowned upon not just by the government agencies, but also donors. While there is no question that not-for-profit associations (NPAs) have to work at improving internal governance and put checks and balances in place, says Vivek Sharma, director, branding, marketing and communications, Oxfam India, many face open-ended challenges too when it comes to defining intention versus passion. “NPAs can’t keep answering questions like why 14% of their funding is used up internally. We too have an office to run, follow standard best practices, hire accountants and auditors to keep track of expenses. There is a cost involved in being transparent and accountable. Not everyone these days joins the development sector solely because they are passionate about a cause and don’t want to be paid for their services," says Sharma. Finally, the issue is not about whether CSOs/NGOs/NPAs should comply with the letter and spirit of the law, argues Anjali Bhardwaj, founder of Satark Nagrik Sangathan, who has been associated with the Right to Information movement for many years. “We are not against the government demanding or enforcing the law. What we are questioning is the arbitrary manner in which the government is targeting NGOs; how it is being highly selective about issues and persons," she says. Have governments, of late, been selective about who they target? Is there a certain area of work conducted by CSOs that is objectionable to governments? Can the lack of foreign funding seriously impact the work of CSOs? Are the laws and their implementation harmful to the fabric of Indian democracy? 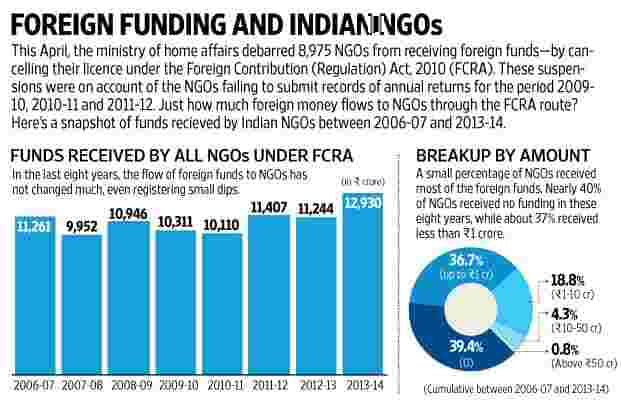 Starting with a graphic today on how much foreign funding Indian CSOs have received in the past eight years (last financial year’s figure was a fraction of what came in as foreign direct investment), to how about 37% of them have received less than ₹ 1 crore in this period, we will over the next few days examine the trust deficit that seems to be widening between CSOs and the government, and its implications. Arundhati Ramanathan in Mumbai and Moyna Manku in New Delhi contributed to this story.